A new salad concept is coming to Terminus. Wildleaf, a new "upscale salad-centric QSR," plans to open this summer at Terminus in Buckhead. The new eatery replaces both Yogurberry and Page One News & Sundries which closed previously. According to online leasing records, the combined space is a mere 986 square feet. 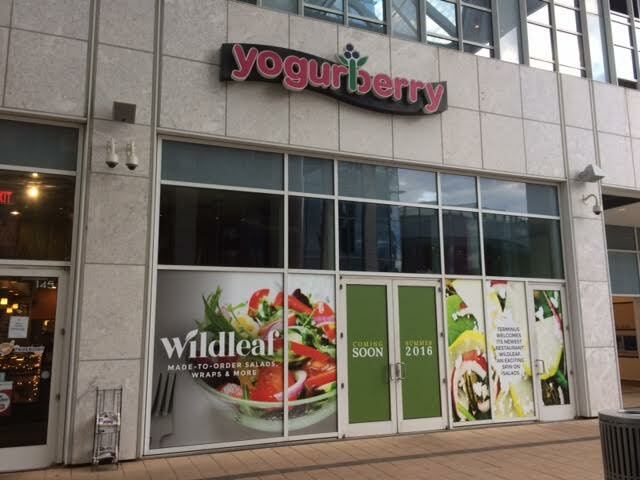 According to the signage, Wildleaf will feature "made-to-order salads, wraps & more." Wildleaf's Terminus location will be the restaurant's first, but owner David Morse reportedly "intends to rapidly grow to multiple locations in Atlanta." Despite claiming that the eatery would be open "in May," little, if any, work has been done on the space. As best I could tell, there was still a wall separating the two units. I was unable to find any active website or social media presence for the restaurant. Dressed, a seemingly similar concept, was previously located around the corner, on the Piedmont Road side of the building. Dressed was the brainchild of Justin Smolev and had a number of locations in metro Atlanta. The Terminus location opened in early 2009, followed by a location in Dunwoody a short time later. By the end of 2009, both had closed. The Terminus location is now home to Subway. The original Dressed on West Peachtree Street in midtown remains open as do a handful of international locations. Wildleaf will have two advantages over Dressed. One, the wind tunnel effect that had been a problem for eateries like The Flying Biscuit Cafe and Yogurberry has been remedied. Where once there was a literal breezeway, there is now more of a courtyard. Two, CycleBar, a new-to-market cheaper alternative to Flywheel, will be opening soon in a portion of the former Cantina restaurant space. If popular, CycleBar could supply a constant flow of potential customers to the health-centric upstart eatery. Do you think Wildleaf will find success at Terminus? Do you miss Yogurberry's owner Brian and his tremendous enthusiasm? If Wildleaf is successful, where else should they open locally? Can't wait, Terminus needs a healthy eatery. This will be great!!! Healthy choices are hard to find in that area! It will have huge success!